Another Super Bowl. Another year of insane moments and absurd advertisements. Maybe it's us, but this one felt even more surprising than previous years. A win from the underdogs, a loss for the greatest quarterback of all time, and advertisers that managed to steer clear of political messages, and in particular, one that didn't. It was a whirlwind of emotions, and we’re here as always to break ‘em down for you. Let’s ‘kick off’ (sorry, couldn't resist) our analysis with the ads, shall we? We will be taking a look at YouTube since it’s one of the most popular platforms for Super Bowl ad viewing. Note: Tide, T-Mobile, and Sprint — despite having wonderful advertisements — disabled comments on their YouTube videos, so we can't include them in our analysis. The intense new trailer for Marvel's Avengers: Infinity War inspired 1,725 Love Reactions from fans. Fans mainly expressed their Love for Iron Man (played by Robert Downey, Jr.) a popular hero who appeared more than once in the trailer. The Amazon Echo spot, in which Alexa loses her voice and induces panic from Jeff Bezos, inspired 946 Love Reactions. Fans expressed most of their Love for rapper Cardi B who played one of Alexa's unfit replacements and constantly insisted on playing her song Bodak Yellow. Beating out NBC's The Voice and Amazon's Jack Ryan, HBO's Westworld trailer inspired 174 Love Reactions mostly about the decision to use Kanye West's song Runaway. The song was a perfect fit for the surprise trailer and added an extra layer of drama to build hype for the upcoming season. It was impossible to ignore the Most Hated Brand Spot on YouTube post-Super Bowl — the controversial Ram Trucks ad featuring an MLK speech. It was the only ad to use a political figure (or anything remotely political for that matter), and boy, you could say it was a bold move. Among other issues, the specific MLK speech they chose to highlight was the biggest problem. In a snippet from the same speech, MLK warns of the dangers of advertising and their exploitative messages (ironic, much?). A little extra research on Ram's part might have helped avoid the PR nightmare they've recently found themselves in. 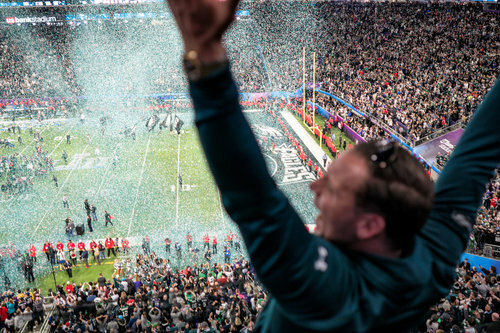 One of the most Loved moments was when Eagles coach Doug Pederson made the call to go for the touchdown on the 4th down using a risky and elusive play. The surprising, epic resulting touchdown caused a 62.41% spike in Love Reactions with good reason — some say it was one of the best plays in Super Bowl history. The Funniest Moment was when the Patriots quarterback Tom Brady dropped a catch, a moment that caused a 228% spike in Funny Reactions. Many fans pointing out that Tom Brady's may have amazing passing skills, but lack of overall skills in Football. One of the Craziest Moments was when Eagles quarterback Nick Foles magically turned into a wide receiver and caught a touchdown pass. That moment inspired an 80.12% spike in Crazy Reactions. Surprisingly, the most Disliked Moments of the game took place in the halftime show. Usually a favorite for football and non-football fans alike, the showed caused a 73.71% spike in Dislike Reactions. The spike was driven by viewers saying they Disliked multiple aspects of the performance, including: Justin’s outfit, song choice, and the display in general (so pretty much everything). But more than anything, viewers seemed to Dislike the tribute to Prince, with fans mentioning the Prince/JT feud over a decade ago. As you expected, every year the Super Bowl has the good, the bad — and the Brady. As always, your friends at Canvs are here to sort out every heart-wrenching, tear-inducing, TV-smashing moment.